Marseille will approach Salomon Kalou in January regarding a move away from Chelsea. The Ligue 1 club are keen on Kalou and will be allowed to bypass Chelsea and contact him directly when the transfer window opens. 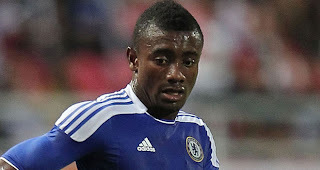 Kalou's existing deal at Stamford Bridge expires next summer and he will be free to move for nothing - although there are rumours Andre Villas-Boas could yet offer the Ivory Coast international a new deal. Marseille are keen, though, and will look to sort out a deal. Didier Deschamps is said to be interested in the 26-year-old but has not ruled out the possibility of taking him on loan first. The move would lead Chelsea striker Kalou to France for the rest of the season and then it will be up to Deschamps to make the switch permanent.